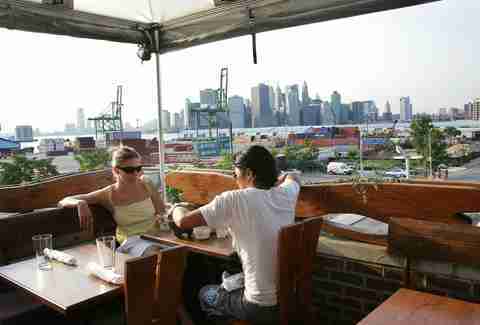 Summertime dining is better on a rooftop. 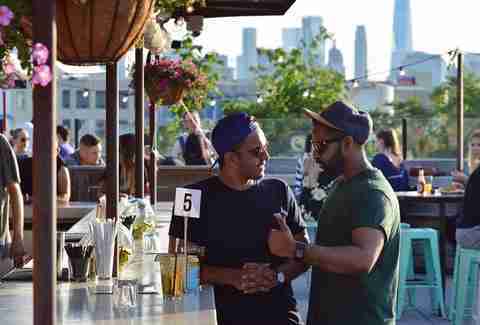 It might be the NYC skyline, it might be the altitude, or it might be the seven glasses of frosé you consumed: Eating and drinking on a rooftop is like MSG for ambiance. Sky-high and outdoors, on a rooftop, deck, or in a pool, cocktails are colder, fresh Maine lobster rolls are chunkier, and ice cream sundaes are sweeter. And with the sun’s amber hues lighting your face, and the warm breeze in your hair, you might even be a little better looking. 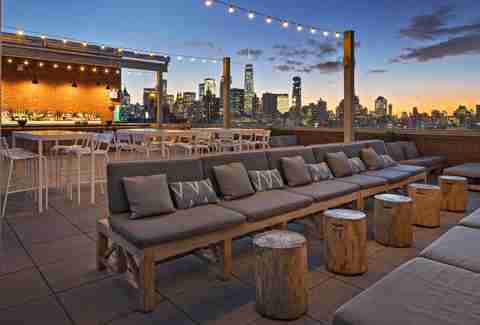 Prepare to luxuriate at NYC’s greatest rooftop restaurants. You come to Alma for the rooftop views, and you stay because two long, narrow flights and an even longer walk back to the nearest subway after a pitcher of margaritas are risky endeavors. House-made fiery hot sauce is funneled into Corona bottles and tastes a little different with each batch; fajitas come sizzling with charred veggies and marinated Angus skirt steak; and the mole anything is utterly addictive. 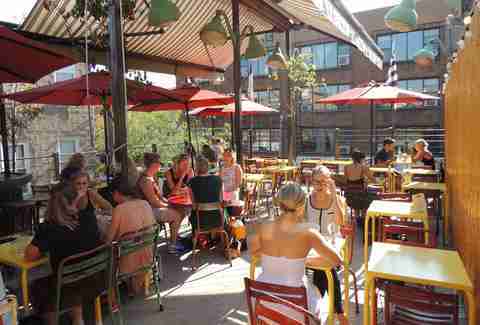 This is the sort of place you’d come to eat (and drink) even if it weren’t rooftop-situated. 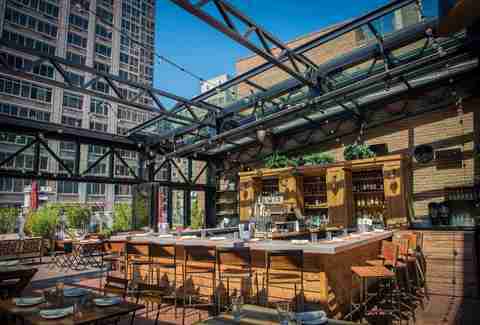 Bia is the rooftop you’ve been looking for. Folded into South Williamsburg, far from the foot traffic streaming from the Bedford L, the place is rarely crowded. 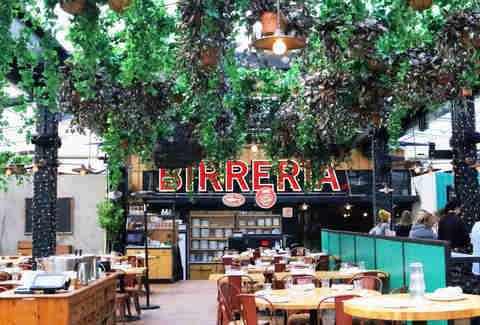 The interior is dim and industrial -- divier than a typical Vietnamese restaurant -- with wooden picnic tables and scattered chairs on an unassuming rooftop deck. While food is not technically allowed on the roof, people have been known to sneak some up. 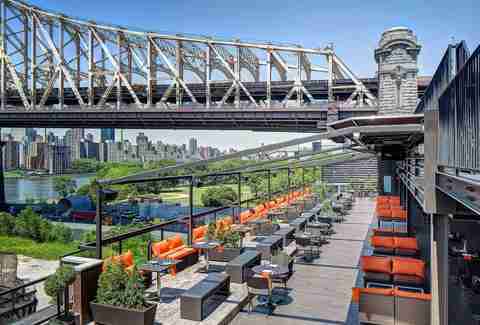 Atop the Ravel Hotel, Penthouse 808 boasts sweeping views of the Queensboro Bridge (take that, Williamsburg). The kitchen slings a warm-weather appropriate light bites of the salad and sashimi variety. Opt for specialty house rolls (think tuna, yellowtail, coconut, mango, and jalapeño), or the sticky pork belly ribs. The shiny-dress set will enjoy club vibes and ice cold lychee martinis. The McKittrick Hotel has plenty of spectacular offerings beyond its signature interactive theater production, Sleep No More. 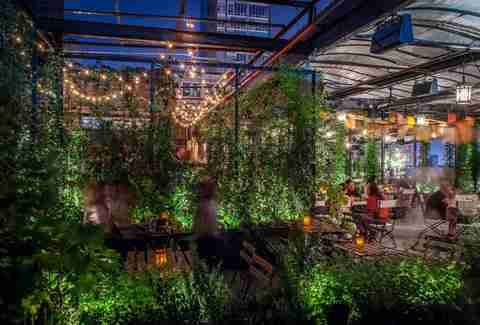 Its rooftop restaurant and garden, Gallow Green, is just as dramatic. The place is like an enchanted forest, encased in greenery and delicate tea lights. Pizzas arrive topped with burrata and cherrystone clams, grilled octopus is served in a pool of romesco sauce, and the crispy hand-cut French fries are among the city’s finest. Hotel Hugo’s Azul is a little slice of Old Havana, land-locked in SoHo. Vibrant colors and palm fronds frame community tables and plush couches, all situated on the receiving end of that sweet Hudson River breeze. Frozen cocktail machines whir while brunch guests feast on Cubano breakfast sandwiches loaded with ham, egg, and Swiss, or marinated roast pork and scrambled egg tacos. Stick around until Sunday evening for Cuban band Grupo Irék's weekly performance. This summer oasis by Eataly is the closest you’ll get to the Italian countryside on this side of the Atlantic. Fourteen flights up, Serra is lined with light oak tables and hanging plants. Helmed by executive chef Tom Bohan, the menu promises farm fresh dishes like fried green tomatoes in ramp aioli and Creekstone pork shoulder with fried rosemary. Expect plates as colorful as Mario Batali’s prison jumpsuit. 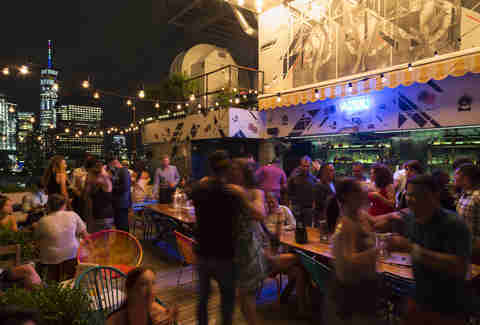 Mr. Purple’s rooftop is about as chic as any spot visited by SVU’s Detective Olivia Benson after a co-ed meets her untimely end. A pool sits between plush deck chairs, and raised tables and low couches fill out the space. There’s an enclosed area for poor weather (sometimes you need a winter dose of rooftop, too), and the kitchen pumps out food all day. Start with brunch (you’ll want the buttermilk fried chicken sandwich and the Balthazar pastry basket) or stop by late night for a prosciutto flatbread and a hummus platter. Or rather, come early, and stay all day. No snitches. 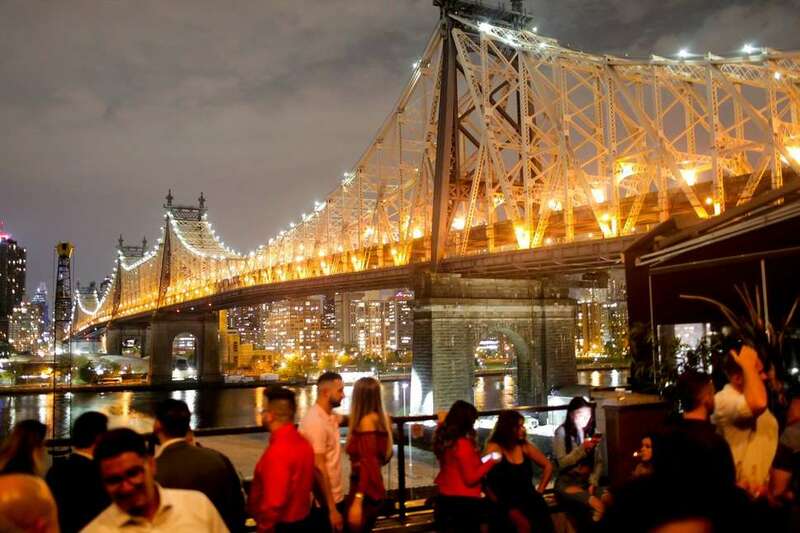 It’s not so easy to negotiate a trip to Midtown, but Refinery Rooftop is worth the trek. Will there be bros in suits? Yes. 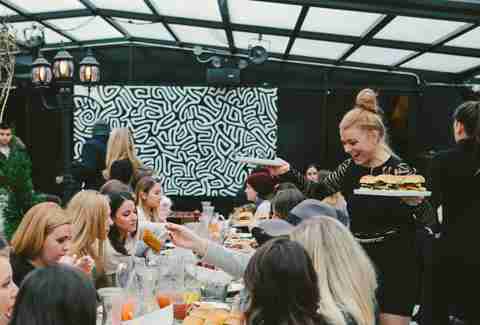 Will the food be good enough to justify the crowd? We think so. Claim a table, order a craft cocktail from a skilled, flashy bartender, and settle in for a flatbread with roasted mushrooms, fennel sausage, and burrata. Snacks shine, too -- think Maine lobster tots, grilled octopus skewers, and the once ubiquitous, still delicious truffle fries. 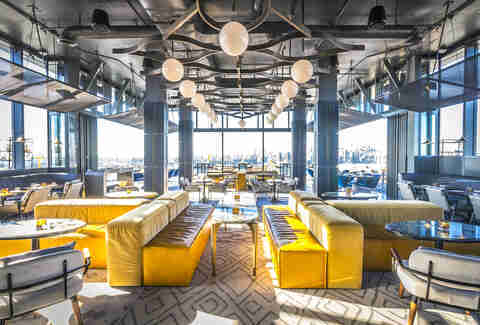 This Australian rooftop spot starts food service at 5pm and boasts beautiful Manhattan skyline views -- especially at twilight. Of course there’s avocado toast on the small bites menu, along with an Aussie meat pie and a sausage and fries plate. Heartier options include a sharable fish fry and an Aussie beef burger. This rooftop was seemingly airlifted from the Left Bank and dropped on Ludlow Street. The floor is tiled black and white, and vintage-style black lampposts illuminate the space after dark. Dine on butternut squash cavatelli with candied walnuts and browned sage butter, or stick with braised short rib on a bed of creamy Parmesan polenta. Brussels sprouts are doused in apple cider and served on the stalk, and if you’re on a date, hit the fondue. It’ll make anyone melt. Twenty-two stories over the luxe William Vale hotel, Westlight offers prime indoor and outdoor space. Inside, you’ll dine inside by candlelight at low-standing marble tables. Andrew Carmellini’s menu is a cultural melange of burgers, empanadas, tempura, and coconut tres leches cake. Outside, you’ll enjoy unobstructed skyline views, cocktail in hand. We are of the class that supports ice cream for dinner. Named for a Walt Whitman poem, Ample Hills dishes out some of the city’s tastiest, most decadent ice cream. Sample the Nonna D’s (brown sugar cinnamon ice cream laced with hunks of Nonna’s oatmeal cookies), or The Munchies (pretzel-infused ice cream with clusters of Ritz crackers, potato chips, pretzels, and M&Ms), then take you mountainous cup or cone up to the sunny roof deck. 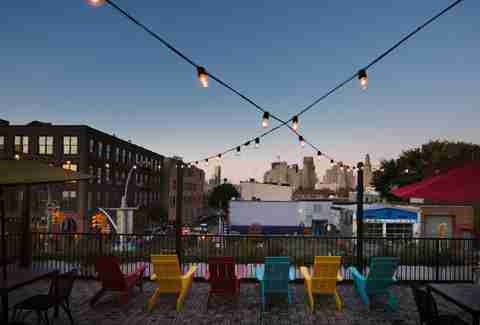 Nothing tastes better than ice cream in the sun -- especially with a peppering of that ol’ Gowanus aroma. Graziella’s is a Clinton Hill secret. The narrow, romantic Italian joint is a neighborhood staple with one of the most idyllic rooftop dining spots in the city. String lights weave around lattice fences, and guests dine on classic Italian fare, overlooking rows of the neighborhood’s classic brownstones. The antipasti and the fresh pastas are worth ordering, and the standout option is the made to order wood-fired pizza. Go white (gorgonzola and grilled onions), red (creamy burrata with tomato and basil), or order your pizza in calzone form -- and don’t you dare request any substitutions. If you’re looking to avoid the tirelessly hip Williamsburg romper crowds, Juliette is not your best bet. 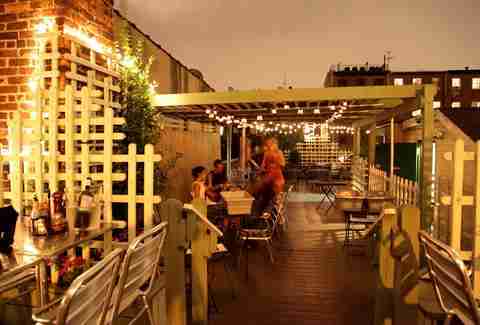 But this rooftop French bistro is a local favorite in spite of its wealthy hipsters. The daily selection of French regional and local cheeses is superb; the crispy duck confit is as succulent and juicy as you’d expect of any Seine-side French bistro; and the warm apple tarte tatin is perfectly browned. The wine is just as impressive as the food, and it all tastes that much better when consumed on a sunny, spacious patio. Eliza Dumais has already had 7 glasses of frosé. Follow her @elizadumais.